When the Maryland Chevelle Club advertises “Rain or Shine”, the show will go on. For those that missed it, this year we had to put our money where our mouth is. The 19th Annual Mid-Atlantic Chevelle Show & Swap/ACES Northeast Regional was held on June 24 and 25, 2006. The weatherman had predicted a weekend full of gloom and thankfully, they were only about half right. Friday afternoon, participants started arriving at both the Crystal Inn Hotel and the show field at the North East Community Park. Decision time. Do we believe what we have been hearing all week about the weather and move the show now to the backup location or take a chance and keep business as usual. The park offers a location like no other. A nice grassy field, plenty of parking and of course the spectacular views of the bay. The backup location offered asphalt parking and a nice view of the Wal-Mart. After inspecting the field, it was decided we were going to roll the dice and stay at the park. We hadn’t had much rain, so the field was about as hard as a brick and if it did rain, hopefully most of it would just run off. In order to keep the cars lined up as straight as possible, we went “high tech” this year! 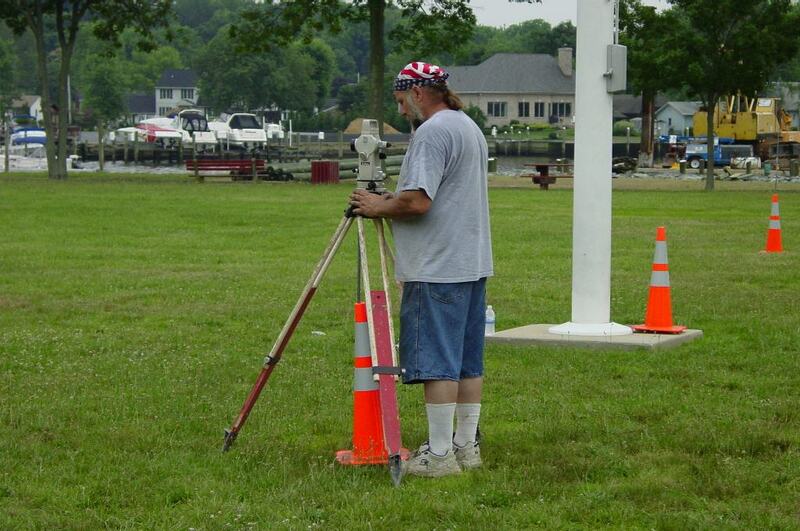 Tom Rightler’s Dad Scott was able to procure some surveying equipment and was soon directing the guys. A little more left, right, little more left... STOP! The rod was hammered into the ground and the process was repeated, many times over. Orange tape was then laid on the ground from stake to stake and boy were they straight. The next challenge would be for the parkers to line them up on the tape.